The success of the construction of a tunnel not only depends on the most suitable tunneling machine or method for the expected conditions but also an efficient system to remove the spoil out of the tunnel and bring in consumable items such as segments, grout, foams and oils. If a conveyor system is installed as the primary method of spoil removal then the machine still needs to be supplied with the consumable items. 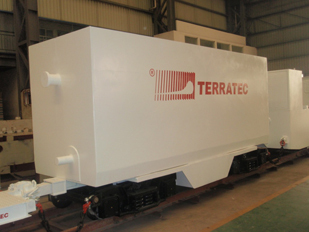 TERRATEC battery locomotives are designed to provide the tunnel with the most reliable material handling solution possible whilst introducing the minimum amount of environmental impact in to the tunnel environment. TERRATEC has in its last 25 years provided all types of rolling stock from flat cars to crane cars, from muck cars to grout cars if using an integrated chassis solution TERRATEC can provide the chassis only and the drawings for the manufacture of the muck boxes or flat car decks locally (this reduces shipping costs and time as well as engaging the local community where your fabricators are located). There are many options to be considered. 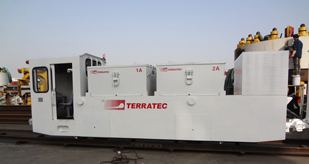 TERRATEC's contact person will assist the clients to select the right one.